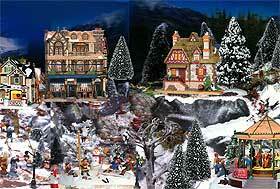 The whole idea of a miniature winter village at Christmas time has religious origins and was often something of an addition to a traditional nativity scene, usually being displayed beneath the family tree. In the middle of the 20th century, the whole idea of Christmas villages became hugely popular, thanks to the introduction of cardboard cutout buildings and other more elaborate accessories. Later on in the 1970s, hand-painted porcelain buildings came along, courtesy of Department 56 (a giftware company in the United States), taking the idea of a winter village to a whole new level with the addition of various different illuminations and moving elements. Themed buildings allowed a multitude of scenes to be created, often appearing as if they had jumped right off the pages of 'A Christmas Carol' by Charles Dickens. Taking it one step further, the Lemax Village Collection was born in 1990 and these beautiful, intricate porcelain buildings began to directly compete with Department 56. Miniature model fairground rides were added, along with literally hundreds of figurines and accessories, allowing Christmas villages to be created with ease, being limited only by imagination and budget - and available space. Today, both Department 56 and Lemax continue to manufacture their buildings and moving table centrepieces. However, the real problem is that whilst their buildings are without question real works of art in their own right, they are really quite expensive, particularly if you buy several at once. Therefore, many people choose to gradually build up their collection over a period of years, making it something of a family tradition to choose the next purchases together at the end of November or the beginning of each December. 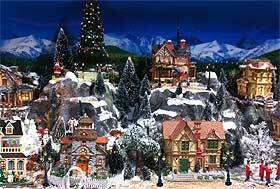 The more creative and artistic you are, the more realistic your Christmas village is likely to be. There are many ways that you can save a lot of money if you are prepared to put in a little time and effort, making the whole process not only more affordable, but ultimately more satisfying. Making extremely realistic deciduous trees is as simple as searching out twiggy branches, trimming them to size, inserting them into modelling clay and then giving them a judicious coating of snow spray. Whilst you can buy pretty much everything that you could possibly need these days, it is more economical and more gratifying to make as much as you practically can, making it something that the whole family can assist with, regardless of age. And access to a good model shop will certainly help when it comes to the all important finishing touches. Of note, always be aware that electrics and fibreoptics are a potential fire hazard, so choose your materials carefully, don't overload sockets, don't leave displays unattended and be sensible when designing your layout, exercising commonsense at all times. These days, many pieces run on batteries, so a mains electrical element may not even be necessary. 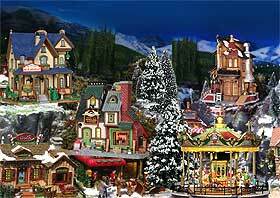 Hopefully the following ideas will serve as a little inspiration for budding Christmas village creators everywhere.